Belleek Wicklow Head Lighthouse ornament is a china bell that is fashioned after its namesake in Co. Wicklow, Ireland. The Belleek Wicklow Head Lighthouse ornament is crafted of fine china and features hand-painted green shamrocks. 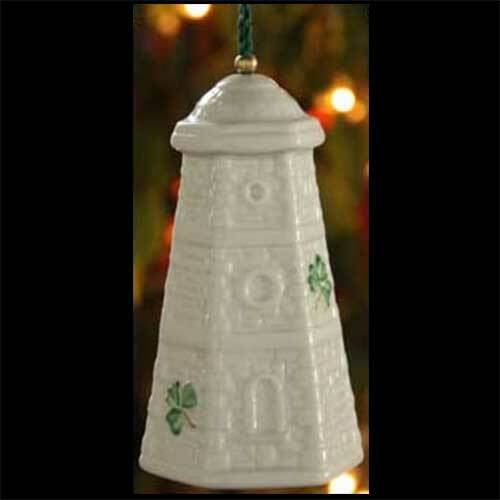 The Belleek lighthouse ornament is a functional bell that measures 4" tall. The Belleek ornament is ready to hang on your Christmas tree with the Included green cord. This Irish lighthouse ornament is handmade and hand-painted in Belleek, Ireland and it is gift boxed with a shamrock history card, complements of The Irish Gift House. Belleek Old Head Lighthouse ornament is a china bell that is fashioned after its namesake in Kinsale, Ireland. Belleek Haulbowline Lighthouse ornament is a china bell that is crafted after its namesake in Co. Down, Ireland. Belleek Shrove Lighthouse ornament is a china bell that is crafted after its namesake in Co. Donegal, Ireland.